Highlights: Visit Leavenworth (German Pigs Trotter Lunch), Mount Rainier National Park, Olympic National Park (Hurricane Ridge, Lake Crescent), Snoqualmie (Snoqualmie Falls). After guests have been picked up from the specified departure location, we will begin this tour. Today, we will see Olympic National Park, which contains nearly one million acres of land and over 900 hiking trails. We will get to see the park’s two main attractions, Hurricane Ridge and Lake Crescent. Today, we will visit the Snoqualmie Falls, one of the state’s most popular scenic attractions. Then, we will visit Leavenworth to see the German style village and enjoy an authentic German Pigs Trotter Lunch. Today, we will spend our time in Mount Rainier National Park. The mountain itself is circled by the Wonderland Trail, which is covered by several glaciers and snowfields. 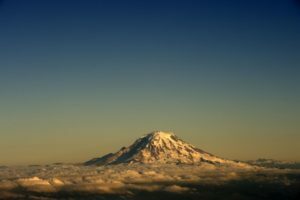 Mount Rainier is a popular peak for mountaineers. We will drive along Paradise Road, where we will be able to see plenty of the park’s attractions. Afterwards, we will return to Seattle, where the tour will end. Please see “Departure and Return” for more detailed information regarding pickup and drop-off times and locations. Buy 2 Get 3rd Free / Get 4th Free : (1) Cancellation of free-fare passenger must be made at least 7 days before departure. (2) No-show or late cancellation incurs a $135 penalty fee for the reserved bus seat.